My final project was a clock. I planned on doing an abstract design but I still wanted to keep it simple. These were the 4 designs I had to decide between. I chose to do the half circle design with the 4 etched rectangular designs. I liked how half of it is like a regular clock while the other half is somewhat abstract. The half circle is 4.5 inches and the 4 rectangular etches are 1.125 inches. 1.125 times 4 is 4.5. The lengths are equal. This is the Adobe Illustrator design of the clock. I added a fifth rectangular etch piece and shortened each side from 1.125 inches to 0.9 inches. These are the updated pieces of Aobe Illustrator design. I changed the design even more. The lines from the previous rectangular etchings would have affected the 12 and the 6. It is now a 4.5-inch half-circle with an extra 0.9-inch rectangle attached. There are 4 separate 1.7-inch wide rectangles leaving 0.8 inches for room for glue. This is the cardboard cutout of each design. Each piece is assembled with tacky glue. This proved that the changes I made to the previous designs are usable. This is the final design of my clock. I decided to stain it dark and keep lighter numbers because I like the contrast. I had to level out the motor with a scrap piece of wood. I also decided to cut the clock hands to make them a little shorter and make one white and one black. I also arranged the numbers differently on the right side of the clock. Since the left side is like a regular clock I arranged the numbers normally. The right side of the clock is arranged differently because of the more abstract design. On the first day, we began with trying to design and make an amplifier. Then Mr. D told us that we should make a bluetooth speaker. Mr. D already had the basic bluetooth set, so all we have to do, is buy the other materials needed, and assemble the speaker. We were very interested in making the ampliphier meaning the thing the speakers sit in. Our original design was to have the speakers inside cheif wahoo, and the sound would come out of the mouth. Today we also received the circut board, which was in a set Mr.D gave us to connect, to the speaker. This board generates electricty is what essentally gets the speakers the play music. Next class we will envistigate more how to use it, and charge it. Today we decided to start working on our paper prototype of the speaker, and finalize our design. The image of our design is attached below. We would like to do that desgin, but also with a "Day of the Dead Theme". Today we were able to learn more about our circut board. We learned how to charge it, and give it electiricity. The picture is an image of our circuit board, plugged in and working. If you look closely, you can see a blue light that is bright from the electricity. Today, we made a "sloppy" sketch for our speaker design. The front would be a Dio De Lo Muertos skull and the eyes would be the speakers. It would stand up properly because there would be planks attached on all the sides to make it stand up. The fixed some issues with the design in this new sketch. We decided, instead of making a curved edge, we decided to make all the edges straight, so that we can laser cut a side for the speaker. Today, we made a cardstock skull (our prototype). Suprisingly this took us a while because we thought, that we couldn't print out curves on inscape, later Mr.D said we could. we will further this design more with details like the Dia De los Muertos skull. We instead of kerf cutting, make planks for every straight side of the skull. Which wasn't very smart. We then remembered kerf cutting and got hooked on that idea. this is a really basic, design we will further it with more design, like dia de los muertos. Today, we designed the speaker on inkscape to laser cut on cardboard the next day. Mr.D said that instead of making all the edges straight, we could use a kerf cut to make the wood bend. Both of us did not understand fully how the cut worked, so we researched into it, a lot of class. In the bin against the wall, Mr.D showed us multiple examples of Kerf Cutting, but we could not use most of them due to their fragility. Another obstacle we have come across is the measurement. We need to find the measurement of curved lines, and find the perimeter, and create a kerf to fit that perimeter. I believe this process will take a long time. Today we did not have much time to work because we had to clean the room up and look over each other's online webpages. Today, we began the design for the kerf cut that we will be using for the back of the speaker. We bagan by creating a line on inkscape, and then copying and pasting it to create two lines, four lines, etc. We then began to copy a whole row, and paste them below the first row in a jagged order. We plan to find the measurements of the inkscape prototype and use the kerf cut soon. Today we will work on our kerf cut, and finding the measurements of the prototype. this is our Kerf Cut, in Inskape. Kerf Cut, if a way to vinyl cut wood to make it bendable. Our back of the skull will be kerf cut. Basically in Inskape, we make a pattern of lines and copy and pasted and aligned the lines. We will shorten how much wood is kerf cutted, but we wanted to see how it would look and work. now we will work, on printed out kerf cut, and we are waiting for the speakers to come. We made this skull in inscape. Today, the speakers came! We quickly set them up with getting the circuit board ready and plugged in. Than we cut the wires from the speakers so that the white plastic part wasn't there. than put them into the green part of the circuit board, screwed them in, and music started playing. Looking the speaker as the eyes of the skull makes the skull look ten times better. here is a picture, of a playing speaker, for the eyes. This is not what the final design will look like but it helps us get measurments, and get a visual. Next class we will work on, laser cutting our kerf cut, but today was definatly a day, full of progress and success. Today we also agreed upon making a kerf cut socket for the speakers to sit in, because without that, the speakers wont be stable. Today we,cut out our kerf cut sides, for the skull. We hot glued it down to the side, because its a prototype. We also made kerf cut sockets for the speakers to sit in. We made these designs in inscape, and just laser cutted them out. It surprisingly wasn't that hard, we just made a pattern in inscape. Although this is just a prototype, our gluing methods were not the most accurate, and some of the edges around the top curve were showing. This bothered us quite a lot due to our need for perfection, but we decided in the end, it was just a prototype, and perfection is not needed. So today we cut out the sides for the straight edges. We ran into a dilemma though, because we didn't print them the same height as the kerf cut. We realized this when we were gluing them down and fixed the side measurements. We changed the inkscape measurements for the carboard measurements through inkscape, and it fit perfeclty. Now all we have to do is make sockets for the speakers to sit in, and also find a space for the kerf cut. So in todays class we came up with a creative idea, to have speakers sit in kerf cut, in inside of skull. This would be alternative to screwing. We didn't want to screw because we didn't want nails to be showing. This would also be an alternative to hot gluing. This class we also printed out cardboard back of skull. The Kerf cut also provided quite a stable support to the speakers, but we were not sure whether the speakers would stay in place with the fragility of the cardboard. this is a picture of back of skull printout. image we kerf cut sockets. This class we put everything together. We took the speakers out though because it is just a prototype. We also had the idea to have the mouth be piece of paper and circuit board would sit on that. Next class we are just going to start on wood prototype. this class we began our wood prototype!! We printed our wood skull, and also printed out the kerf cut. In the picture, you can see the kerf cut attached to the skull. This took us a very long time because we wanted it too look very professional so wanted to take a long time glueing, so there weren't any errors. We were very satisfired with doing this because we are getting closer to being done class by class. this is a picture of our printed out skull, w kerf cut on outside. This class, is our second to last so we planned on doing a lot, and we did. We printed out all of, the sides, thorugh laser cutter, and inscape. We also set the speakers up in the eyes, printed out a back to the speaker, and decided upon making kerf cut, be in the mouth so the circuit board could sit on it. . We also make an acces point for the charger through a side of the wood. this is a picture of the access point for the charger. We simply just, cut out an opening in one of the sides. this is a picture of the sides cut out, we cut out these sides through inscape. this is a picture of everything together, and the speakers set in the eyes. We simply just got glued the speakers in the eyes. We made the finished touches this class! All we have to do now is make a presentation! this is a picture, of cardboard prototype, and the finshished one. This project was extremely fun to make. My partner Luke and I both worked hard and well together to create this speaker. Our initial design was to create an amplifier with a 3D printer, but Mr. D lead us in a different direction. We ended up creating a Bluetooth speaker in the shape of a skull with the speaker as the eyes. From the beginning our project has always seemed to have gone right for us. We never really stumbled into any major changes in the design after deciding on a Bluetooth speaker. Also around the top of the speaker we used a kerf cut to account for the curve. With the exception of the materials used to make both the Bluetooth, and speakers connect, our design was totally built with wood. The look of the kerf cut was just so cool that we decided to use it as the mouth of the skull. yet I am most proud of how we were able to finish this project, and be satisfied with the product. There is such a large feeling of accomplishment when one creates something on their own (or with a partner), and that feeling was something I had never experienced before. Both Luke and I learned so much throughout the project, but the main takeaway from this experience is that so much is possible when you are given both time and materials to create whatever you want to. This project really taught me about the tools that were available to me in the Fab Lab. I originally though about this project when I learned we had a final project in Modernism, and I decided I wanted to build something in the Fab Lab. I decided to build a model, and researched many different buildings like the Chrysler building and the Empire State building. In the end, I decided on Villa Savoye because it was an interesting building that represented Modernism well. I wasn’t sure how to start the project, but Mr. Digorgio helped me figure out I needed to find a PDF of the floor plans. Luckily, I found the Corel files, and from there I managed to build the walls needed to build my model. I felt kind of uncomfortable about gluing my walls with tacky glue, but in the end I used the glue, - and hot glue in the end - and managed to finish my project. I learned a lot along the way, mainly learning how to turn an idea into the final product and how to solve many different challenges. I especially had trouble with making the project look nice and using the spray paint. I managed to spray paint most of it, but I did mess up spray painting the green part. However, I learned the best way to spray paint, and how to make a project look nice. I used many machines, like the laser cutter and band saw, and put everything together to get the final project. Today I started by narrowing down my building to the Villa Savoye Model. I researched different models and designs, and found a helpful website. I'm planning to use floor plans to build the base, and see how that works. Then I can use the laser cutter to make the pieces of wood that I need to build it up. Today I found the rhino model of Villa Savoye and figured out how to import it on Corel Draw. I opened it up on Corel and separated the different layers out. I also decided the scale of the model, which is 1:65.8. I can now start making the sides and walls of the first layer. I changed the scale to 1:49.2 so it could fit on the laser cutter. I chose that because it was the largest scale that would fit. I printed out my first version but I decided it was too small so I reprinted with a bigger version. Unfortunately I forgot color mapping, so it is less sturdy than I wanted. My next step was to find the height. My first step was finding the height. I decided that the original was around 2.75 meters, which was around 9 feet. I divided it by my scale to get the height of 2.200563. I then used Corel to make three walls that I have to print out. I also realized that when I printed out the floor, it cut of the end, so I have to reprint the floor as well. I'm ready to see how the walls will work and hold up. I started making more walls for my prototype and printed 3 out. I first glued them, but then Mr. D told me to wait on gluing them and just get them all printed first. I'm making the rest of them now and will reprint the base and attach the walls. I printed them out and started marking and labeling my floor outline. I struggled to figure out how I would print my cardboard walls out and then know where to actually place the walls, since they all looked similar. I ended up having to do a complex system of labeling them. I started gluing them again, and just spent the day finishing making them. I faced some struggles using tacky glue, and it took a while to dry but in the end I finished. I started making the second floor walls, and also cut out the second floor outline. The way I make the walls is by making a square the size of the sides on Corel and then making it the height of every other wall. I finished the second walls and printed them out. I have to make sure I don't lose the pieces so I know where everything goes, because I labeled them based on the outline, so where each piece is on the cardboard is where each piece should go on the screen. I spent 5 hours in a row working on this project. I started by gluing the second walls on and then I printed out the third floor outline. I wasn't sure if I had to cover the top, but I looked at an image of the building and realized I didn't need a roof. I faced a big challenge when I printed out the wall and glued it and realized that I needed windows. I had to tear off the wall and cut out a window. I started by cutting out a big hole, but Mr D. told me that the window was not one, and I realized he was right. I tried spacing them out evenly by 0.1, but the space was so small it made no difference. I then printed again, and it looked very nice. Before I glued, I was trying to find a glue bottle that worked well and none of them were easy to use so I decided to use the hot glue, which made the process go so much faster. I glued on all the walls and then I made the third walls. I cut out the third walls and started to glue them on. One problem I faced was that when I tried to bend the cardboard creases appeared and it didn't glue very well. Since the top had a lot of curves it didn't look as good as I wanted. I ended up gluing all of the walls on and finishing all the walls. Then I decided to make the poles holding the building up, and I used the dowel rods we had. I measured the distance so the pylons would be the right size to fit and then tried using the band saw to cut out the rods. Unfortunately they were uneven, so I decided to use the later cutter. I put a straight line and then put the rods in the laser cutter. It cut them all evenly, but the top of each one was burned. I also needed to know where to put the rods, so I used the outline of the holes on Corel and then moved the floor down on the laser cutter so it would print. It printed black holes on the floor, but some of them were outside of the expected area. Also, the dowel rods on one side were uneven. I glued the rods on and then I finished building it. I learned a lot of different ways to use the laser cutter to my advantage, and I found out how to see the X and Y values for the edges of an object by clicking in the top left. My last step was spray painting it, and I asked Mr. Gainley to use the white spray paint. I let it dry for a few days, and it looked really good. Unfortunately since this was for a project and there were two colors the only other day I could spray paint it was on the day it was due, so I had to spray paint it really quickly and many of the dowel rods fell off. In the beginning, my initial idea for my checkers board was for the board to be made out of wood, the pieces to be 3D printed, and for there to be LED lights. I started off with my project being twice as big as the final ended up being because I realized that the board was just going to be too big. After I decided on the final dimensions, I printed out the board with its Cleveland theme with the laser cutter, and glued it in such a way that the top of the board only comes off for storage. I then knew that I had to start making the 3D printed pieces, and these proved to be a difficult challenge. On the 5th try, I finally printed the pieces the way I wanted them to be: they could stack on top of each other. Throughout my various failed attempts, the pieces would have dimension issues that prevented them from stacking, and I even completely changed the design of them after the 2nd try. The pieces took a while to print. After all of the pieces were printed, it was too late in the course for me to have my original idea of having there be LED lights in the board. It took a class or two for me to figure out a new direction for the project, until I decided that I would create piece holders. Like the pieces themselves, these took multiple prototypes until one finally worked. I then used that design and printed it onto wood using the laser cutter. Upon closer inspection though, I did not like the burn marks the laser cutter made, and I wanted to cover them up, leading to me spray painting them black. The spray painting took the remainder of the course at this time, and I completed my project. I was happy that I could keep my Cleveland roots in the project design, and it's cool to see that I actually made this using my knowledge from this course. 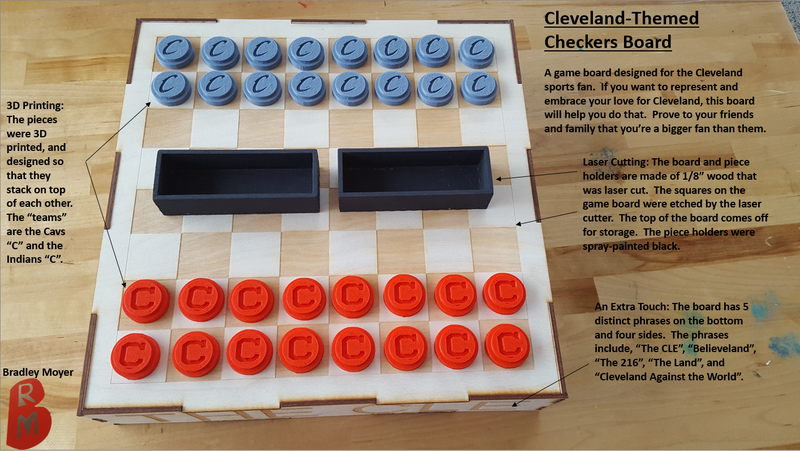 I plan on making a checkers board with a Cleveland theme. The squares, when a piece is on it, I plan on designing so that they light up. It will measure 20" (width) x 20" (length) by 4" (hight) without the tabs. With tabs, the length and width is 21" and the height is the same. The checkers board will be laser cut using 1/8" wood. The pieces will be printed using the 3D printer. This is a cardboard prototype of the checkers board. I made it half the size, and decided that I liked that better than the original 21" x 21" x 4". The final project dimensions will now be 11.5" x 11.5" x 2.5". I also realized here that the tabs that are used to lock the pieces together were to large, so they stuck out. I the changed the tab dimensions to now have a "width" of sticking out of 1/8 of an inch. The final inkscape svg and pdf documents are now uploaded to the page. After 2 classes of laser cutting and gluing, the wooden game board is complete. Keeping it with the Cleveland theme, I added signature Cleveland phrases to the sides and bottom of the board through etching on the laser cutter. The tabs, in some places, were looser than what they were designed to be, but others were perfect. I decided to use tacky glue to make up for the minimal space between the ones which were loose, and they are settled in. I decided not to glue the top part, so the hollow inside can be used for storing pieces and also space for when I need to put in the LED lights in. I have decided that I am going to drill holes along the outside edge of the perimeter of the game board and the edge of the entire thing (kind of like the edge between the fairway and the green in golf for an analogy) to place the LED's. I don't think pressure-sensitive LED's are feasible with the time remaining. Next class I will begin to 3D print the pieces. Above are the first 4 designs I came up with for the pieces, which all failed. The first design is in the far left picture (right one), and there was a gap between the logo and the bottom part of the piece, along with the fact that the pieces couldn't stack. The second design is also in the far left picture (left one) and I ended fixing the gap, but not the fact that they couldn't stack. After thinking about the design for a little bit, I switched gears to a completely different design for my third attempt. The new design has a large circle at the bottom with a hole on the bottom for stacking, along with another smaller circle on top of the larger circle, with this smaller circle having the logo as a negative. The problem with the third attempt was that they couldn't stack, and the logo was well defined. I then went on to try 4, where I made the logo more defined, but they still couldn't stack. Featured below is the 5th and working design! I fixed the problem of the pieces not stacking by making the bottom circle bigger, and the top circle the same dimensions as the 4th attempt. They stack on top of each other flush, and I even found a setting for the bottom of the piece so that the netting doesn't sag, that way it looks nice and crisp. I will begin to print the Cavs pieces next class with the same dimensions as the Indians final piece. The Indians and Cavs piece designs are now attached at the bottom of the page. Over the past couple of classes, I have successfully 3D printed the 16 Cavs pieces. The next step is to determine what to do next, since there a lot of classes to go. For the past week and a half, I have been working one designing piece holders. On the left is the cardboard prototype of the piece holder, and took multiple tries of guessing and checking before it worked well. In the middle, is the wood copy. I decided to take off the top notches, instead making it smooth. I also sanded the corners of the holders so that they are not sharp. Afterwards, I decided that I would spray paint the holders black, since the laser cutter leaves discoloration that does not look good in this instance. I spray painted for 2 classes, until the wood could not be seen anywhere. At the bottom of the page, the Inkscape files for the piece holders are there. After a month and a half, the checkers board with 32 pieces along with 2 piece holders is complete. My initial idea for a project was a laser-cut pinhole camera that shoots on 35mm film. As I thought about the design more and as Mr. Digiorgio pointed out, however, I should have started working on a prototype that shoots on photographic paper instead. The problem with shooting on film was that I had to finish a whole roll in order to see if it worked, while I could take each individual picture on photo paper. At first, I followed guidelines for a pinhole camera that I found online, however after my first three tests, I realized that I would have to expand the dimensions because they were designed for 35mm film. I wish that I originally accounted for the different dimensions, because I had to make a whole new prototype to fit the paper when I already had a working one. The biggest challenge that I faced was figuring out how to make a final prototype light-proof without using any tape on the outside. I eventually solved this problem by adding wooden pieces on the inside of a face to prevent light from entering. I was really happy that I was able to fix this issue before the end of the semester. Throughout the process of this project, I was really able to become comfortable with using the laser-cutters. The final model, cut on 1/8" wood, was glued together with tacky glue and taped on the inside and functions properly. Attached are the in-progress CDR files and the final SVG as well. My initial idea is to create a working pinhole camera that shoots on 35mm film. It would be made out laser cut wood and 3D printed spools. The "lens" would be created out of a thin sheet of metal, maybe tin foil. First, I would have to create a working prototype that shoots on photographic paper. I created a prototype for my pinhole camera out of cardstock. The prototype was made by folding cardstock and gluing it together using tabs. I also created a working shutter and latch for the side. I still have to think of how to get photographic paper in and out of the box. I also need to find a material to make the "lens" out of. I will probably start with tin foil. I created the first cardboard prototype for my camera using the laser cutter.I then taped it together in order to prevent light leaks I also added a "lens" using a sheet of metal, which i poked a hole in then sanded. A few things need to be improved: I think I need to create a different shutter that covers the lens better because it may leak light; I need to make a better latch and hinge (I just used tape); I need to add a way to hold the photographic paper. I should be able to test this prototype by next class. I tested the camera for the first time. The camera was able to produce an image sort of; it was of the area right outside the darkroom, and the lines of the walls are visible. Not sure what the other objects exposed are, but probably part of the inside of the camera (there is also some glare from taking a picture of the picture). There is an issue with light leaks, but Sklad let me borrow a roll of electrical tape, hopefully that will work better than the masking tape. I worked on the cardboard model a bit. The main difference was the back, which a changed the tabs a little bit. I also updated the shutter so there is no chance of leakage. I also used electrical tape instead of black masking tape. I still need to be able to make a hinge. The CDR file I used is attached below. The second picture taken on the camera turned out a lot better than the first one. While the first one was just a fuzzy image, a clear picture can be seen in this one. There is a railing, trees, and the outline of Stirn Hall. There was still some light leaking in, so I have to fix the design a little bit. I cut the camera out in wood this time, updating the design from before. Instead of having a back with some sort of hinge, I decided to close off the whole camera and create a hole for a piece that would hold the photographic paper. The wood I used for this is too thick at the moment so I have to cut it in 1/16" wood with a slot for the paper. I cut out a tray for the photographic paper into 1/16" wood. I used the same model from the wood prototype except for a spot for the paper to go. I also added a small piece of cardstock to keep the paper in place. I took another picture with the updated photo tray and it looks like all light leaks are fixed. The only problem is the size of the image, I need to make the camera deeper so more of the paper will be exposed. I realized from the last test photo that the camera needed to be deeper. I was not sure how much deeper so I decided to create a ratio between the diameter of the last photo and the distance from the hole to the paper. I then used the ratio, which I found to be 3:5, and measured the width of the full photo and found how much deeper the camera should be. I had to add 2.5" to the body of the camera, but otherwise it is the same. I tested out the second wood prototype and it turned out very well. The image reaches farther to the edges of the photo paper, and a clear image can be seen. The only problem was that I underexposed the photo; I only exposed for 16 seconds. I printed out my final prototype. Not much was change from the last one; the main difference was longer guides for the shutter and some guides on the inside for the tray and light seals. My challenge for this model was to seal it from all light without using any tape on the outside. This was really difficult to do because I was unable to tape the inside of the last face. Instead I decided to make wooden pieces that would be glued on the inside to block light. I took these two images together of the same scene. Both showed that I was successful in making the tape-less model lightproof. For the first image, I exposed it for 1 minute and it still turned out a bit underexposed, so I exposed the next photo for 2 minutes, and it turned out better. While the second picture could have been exposed for a little longer, it still turned out well. The only problem with the second photo is that I accidentally bumped the camera during the exposure. However, these tests still demonstrate that the final model is fully functional. Hello, my name is Jackson Helm, and for my final project, I created a simple piano that makes sound through striking tubes of water filled to different heights. The process was long and there were some roadblocks, but with the help of my peers, Mr. D., and the variety of tools I had available to me (laser cutters, power saw, 3D Printers), I was able to make a musical instrument out of just a few household items like wood and glass test tubes, some tape, and plenty of hot glue. The files for the laser printer cutouts are listed at the end of the page if you would like to make this for yourself; please feel free to explore the design process on the way down to the bottom. Thank you! The entirety of the creation of this project has been an incredible rollercoaster ride of learning and fun experiences for me- one that I will surely not soon forget. At first, I had absolutely no idea what anything in the fab lab did or how it worked, as I thought a lot of the machinery in here was largely unavailable to students on a day-to-day basis. As I spent time in this classroom learning through experience and creating many different things each day, however, a new world opened up to me: one where I could create anything I wanted with almost no restriction. I used the opportunity of this world to create something that allowed me to pursue an interest that has guided a lot of my life so far: Music. I gained a lot of inspiration from the music I have been playing at school and at home for the past years, and several videos on YouTube describing instruments others have made with the equipment that is now available to me. After several weeks, through the help of Mr. D, many of my peers, and the courtesy of the school and the equipment of the fab lab, I was able to create my very own musical instrument from my own designs. The set of 8 key-powered chimes plays an octave scale that starts and ends at E, with each tube that is struck playing a different note on the scale. The proudest moment for me was absolutely when I figured out how to play Frank Sinatra’s “Fly Me to the Moon” with the new “Water Tube Piano”. I hope to take it home with me and share it with my family soon, and perhaps leave it to the school for use with young children whom this project may help instill an interest in music in. Please see the below posts to explore each step of the design process. This video (among others) helped me to visualize in the short term what my final project would look like in the end. I have always loved playing music, and the opportunity to create something from scratch that I could then use to make my own new kind of music seemed like an incredible idea to me during the early part of the design process. The creator's design in this video does have some flaws though, as the note tones are not evenly spaced (the person has to jump about 5 keys down to play just one tone lower, and only one key up to play two tones higher). Other than that, the key design seems to work pretty well, even if the keys and hammers seem a bit bulky. Hopefully I can improve upon these designs as I work to create my piano. This sketch depicts what I would like to create for my final project: a musical instrument (similar to a piano) that makes its sound by hitting glass tubes filled with varying amounts of water and causing a sound to be produced. It will be made predominantly out of wood, the dimensions of which may change as I make physical mock-ups. It will be approximately 16 inches long and 10 inches tall, with a width of about 10 inches, likely a little less. When keys are pressed, they will cause another piece of wood with a shaped hardened material as a tip (which will strike the glass tube) to swing upwards. There will be 8 total "keys" that will each strike a tube with a different water level causing a different note to sound (as the tubes will be tuned). The colored pencils act as axes upon which the key and striker rotate. The full design actually is significantly smaller in working scale, which actually seems much more convenient space-wise, so that changes the plan schematics significantly. There is a piece of cardboard suspended on a string which is standing in place of the glass tubes, which will need to be added on the final draft due to limited materials. This worked well for a first try, the next step will be cardboard based and I will likely use the laser cutter to make more accurate cuts and measurements. This diagram, created on Inkscape, depicts the first draft of the paths the laser cutter will follow when cutting out the cardboard version of my design. I am not exactly sure if it will exactly work yet, but I am ready to try it out. The longer pieces at the bottom are the press keys (the ones you physically play) and the striker keys (the ones that actually hit the glass tubes to make sounds). Not depicted here are the thin wooden rods which will fit through the holes on the flat pieces in the middle; there are two, and they will serve as the axis upon which the keys move (far better than the colored pencil in the cardboard design). Created a new way for the piano hammers to swing upwards through orienting them vertically and running the wooden axis through holes so it can rotate more fluidly. Glued down the parts that need it and adjusted some minor cardboard flaps to make the connections a little more streamlined. It seems to be in pretty good working order so far but friction is still high and the piano hammers and keys alike are both flopping around a little too much where I need them to stay still and strike in the same place every time. I will try to remedy this in the next design, but this is a good jumping off point. Instead of relying on the piano hammers to stay in place, I am going to cut out a large amount of placeholder rings to hold everything in the correct position. These will sit with the hammers along the upper axis. I made adjustments to the hammers, they are a bit cleaner and better sized, and will be doubled up so they stay in place better and don't overlap. I again doubled up the squares that hold the press keys in place, and will change the position of each so they stay in the right position. There are now 8 keys instead of 6. I will need to recut some of the designs of the previously made cutout plan so it fits this new design, like making 8 holes for the tubes instead of 6. This ring size appears to work, after several failed attempts to get it to be the right size and width. Hopefully this will take effect when the first wood print is created. Minor edits to the piano hammers- they are a bit shorter and the rings are smaller. The rings were resized slightly to stay snug but can be easily moved from side to side. A solid square was placed on each key to counterbalance the key and facilitate pushing the hammer upwards. The keys were resized slightly to make sure 8 fit instead of 6. Holes for tubes were included above as a result of this. This makes it available to let the piano play an entire octave including the 8th note depending on how much water I put in the tubes. I plan to print an extra set of hammers and glue them together so they have more mass, but I will not do so until I test just a singular hammer on the tube. I plan to add an additional rectangle on the bottom of the key so the resting position of each key is balanced and more natural for someone playing the piano. As it seems that the first key works well technically, I plan to print out the rest of the rings to make the entire key set function together. I may also add rings between keys to make spacing more fluid and compact. They keys were a little narrow and did not fill up the entire area within the two walls, so I added rings between keys to add space, which seemed to work. I sanded down the sides of a few keys to prevent as much friction as I could in those areas. I glued corks to the bottom of the backs of each key to make the resting position higher and more comfortable. I cut out an extra snap-on ring to reduce the space for the piano hammers to move horizontally without restricting vertical movement. I glued in the rods on the sides of the piano that hold the keys and hammers in place so they wont rotate or move around. It's been over a month since my last update, but I've made a lot of progress on making these spinners fully functional. So far, I have two iterations of the spinner with ceramic bearings in the center. I use glue and clamps to put the spinner layers together. One design has two 1/8" layers, for 1/4" total thickness, and the other has a 1/16" layer sandwiched between two 1/8" layers. Both function about the same. I'm now optimizing the cap design. I've used tinkercad to work on the designs using the 3D printer. Once I have a cap that can stay in place in the center of the bearing yet also be removed easily, I will start figuring out how to make the spinners more aesthetically pleasing by painting the wood, etching it using the laser cutter, and perhaps even trying to do the LED light thing Mr. D showed me a while back. Mr. DiGiorgio sent me a link to this cool post on instructables. Adding LED lights could be a cool way to take this project further once I have my design down solid. I'm still working on my cap design while other people use the laser cutter. I've printed 2 new caps on the 3D printer. These ones are flat on the finger side so that they're smooth and take advantage of the heated plate. I'm currently working on 3D printing some caps for my spinner. I made the design so that it's ergonomic and easy to place into the bearing so that one does not have to hold the center of the bearing itself but rather has a fingerprint-sized cap to hold. I might make it so that it stays in place using glue or not using glue so they can be removed. A current problem with the blue caps pictured below is the fact that they're not smoothly printed on the part where the finger holds it, so I might get rid of the lip and just make it so that the part where the finger holds it is printed on the bottom of the 3D printer's plate so that the heat smooths it out. I'm continuing my work on the laser cutter with more iterations of the spinner design. So far, the round spokes pictured below are my favorite. I need to order more ceramic bearings in order to produce more long-spinning spinners. Once I have a solid design for the spinner, a way to consistently make the wood spinner not wobble, and a good cap design, I'm hoping to produce some of these and sell them to friends and acquaintances. The wobble comes from inexact placement of the bearings within the mold, so making the process as exact and precise as possible will be necessary to be able to make these wood spinners high quality. My wood fidget spinner design is complete. I spent the last few days working in Corel to fine tune the design. Making the design was a learning process, and adjusting nodes and learning other tools in Corel made this design possible. I replicated the design I initially had with the 3D printer, and then added grooves on the outside to make it easier to spin. I then spent a couple of days learning how to use the laser cutter to apply my design to wood. Learning the laser cutter is an ongoing process, and I've gone through many different prototypes to precisely size the holes for the bearings. Today, I've been able to use it successfully enough to finally make my first functioning prototype wood fidget spinner. After many iterations, I made two cuts, one on 1/4" wood and one on 1/8" wood, and glued them together. I put glue clamps on, let it dry, and then put the bearings in. It's a little wobbly and it took some sanding to fit the center ceramic bearing in, but it works. Now I want to adjust my design by lessening some of the grooving on the outside and reducing the size of the "wings" on each arm, perhaps even eliminating them altogether. I also want to make the outside a bit thicker because sometimes my prototypes broke. In addition, I'm going to make a good cap for the ceramic middle spinner so that worrying about touching the spinning part and imparting friction/slowing down the spin is nonexistent, as well as reducing the "pain" or nuisance one gets from pressing down on the hole too hard with a finger, causing a circular indentation. Mr. D recommended I switch my design to the laser woodcutter so that I can more quickly and precisely adjust my design. So, I have lost some progress that I made with Tinkercad since I now need to reproduce it in Corel, however, my initial prototypes are looking solid. I have the same basic idea for the shape of the spinner, I just need to optimize it, put the bearings in, and reproduce it. I have a few more steps to take to perfect my fidget spinner. I first need to improve the cap design so that it fits more neatly within the spinner design, and create a few copies once I have improved it. I think I want to decrease the distance between the cap itself and the connector pieces, and make the connector pieces fit more snugly while also being able to be removed easily. I also want to make the cap slightly concave so that it is more ergonomic, perhaps adding grooves for grip. For the spinner design, I am working on it but my goal is to add grooves on the outside for better grip when spinning, and perhaps add an ability to spin it on the finger as well. Finally, once I receive the ceramic bearing, my spinner will be able to spin much longer because it will have much less friction than the regular steel bearings. These steps should make my design better and hopefully make for a neat toy in the end. Today I finished a design for the middle bearing cap on my fidget spinner. It's currently printing but I hope to see it on my design by the end of class today. I think my current goal with this project has shifted from making multiple fidget toys into a conglomeration and more focus on one type, the spinner. This way, I can optimize the design and make the coolest, best possible spinner. I used 8x22x7(mm) VXB shielded bearings (model 608ZZ) placed in 22mm diameter holes on this 4-hole shape. I sanded the insides of the holes, used a "soft hammer" to knock them into place, and now it spins for a solid 10 seconds. Using Tinkercad, I plan on making a cap for the center bearing. The inside diameter is 8mm, the outside 22mm, and the thickness is 7mm. Today I also completed all of the Tinkercad lessons. Magnet Entertainment: This could be developed to something as simple as a magnetic plate and a small ball bearing. http://fidgetland.com/: Another simple toy that could be adapted to a multi-functional system. Another idea I came across was to use coins as weights, rather than other bearings. I've been thinking about what individual functions I can implement into my "conglomeration" of fidget toys into one toy. I came across some cool fidget spinners from https://addictivefidgettoys.com/#shop. They work with bearings that rotate around an axis and have symmetry, allowing for up to 6 or more individual arms. I want to use the idea of the Fidget Cube and make a toy that combines different functions that allow you to fidget by spinning, clicking, flipping, and rolling. I've also been thinking about common ways I fidget normally, such as spinning my phone on its back, flipping pencils, clicking pens, tapping my fingers, spinning my keys on their lanyard, and more. My end goal is to make a system in which I can attach and detach different fidget toys and use them one at a time, as opposed to the pocketable Fidget Cube which requires lots of small parts and is not easily replicated. Other functions I am considering include rolling marbles, a stress ball feature, and a pen click feature. As a part of Ian and Matt's speaker project they asked me to help them print out two 9-Volt battery containers to hold the batteries inside the speaker. At first (as shown below) I took the dimensions of the battery provided and extended the inside of the box about a half of a millimeter more for a snug - but not super tight - fit so that when they need to change the battery they can somewhat easily. I included an open top for the battery to fit through and a bottom in the shape of an oval so that one of their fingers can push it out. The overall rectangular prism had an infill of 50% and high quality print to make sure the box would be durable enough (4 millimeters thick) to not crack or break. For my second print, I took the two separate boxes and combined them together to create one functional piece. It is difficult to create an exact fit for the 9-Volt batteries because each brand makes slightly different sized batteries (some rounded, some fatter, skinnier, or taller, etc.). This model worked and fit perfectly to the dimensions of two Sunbeam Super Heavy Duty 9V batteries. With the holes in the bottom of the casing, it will be easy to change, however the only future complication would be if the new batteries had different dimensions. For now we are okay and with the wires soldered it functions well. This is the printed out version of custom air vents that allow for air flow within the speaker. By allowing a place where air can escape, this provides a reduction of vibration and shaking of the speaker overall. Ultimately, this prevents the bass of the music and speakers from destroying it, and really increasing the quality of the speaker for the user. Additional foam in the back behind the speakers helps to reduce the vibration as well. This is the end result with the tubes full attached and glued onto front of the speaker, aligning with designed holes already laser-cut into the wood. After fully testing it, it is verified that the tubes do their job in lowering the vibration and excess noise that accompanies the bass. Also, in the top left corner I adjusted the size of the purple covers (shown below and now a clear blue color) to stabilize the buttons and have the box be secure. I printed out buttons and covers for each of the screws (slightly bigger that the bottom part of the buttons so that the top of the box sits firmly on top). It was difficult for to print out these objects and all at high quality as they are small. I had to adjust both the speed of the 3D printer and the temperature originally set at default. I ended up using the first set of buttons that I printed out because it was found to be too difficult to print out the smaller radius of the buttons (4.5 mm as opposed to 6.6 mm), so I had to reprint the covers which I found to be much easier as there is only one radius for the whole piece. The only other machine that I hadn't worked with significantly was the laser cutter. I created a button cover that indicated play/pause, rewind, skip, increase volume, and decrease volume (from the left to right). I laser cut the screw holes and button holes out of the red acrylic and then etched off the surface to allow the white figures to shine through. Brendan Paul and I wish to build a Tripod model for his camera in order to prototype and bring to life a fully functional project. It may not contain all of the bells and whistles or be as complicated as a commercial grade model, however our goal is to make it work as a stable and unwavering stand for his camera. It will involve a heightening technique to change the angle vertically of the picture or video and be not only adjustable, but portable as well. I want to create this project because it would be exciting to see and use an actual project that can be used in photography, etc. This will be a challenge in that it is not only large, but also has to be able to bend and move to adjust the camera angle from two and a half feet to around seven feet tall. I am intrigued and determined to bring this project to life and am eager to finalize the design in collaboration with Brendan. This is a model that was designed online in creating a ball and socket joint that Brendan and I will create. We are going to use Tinkercad to create our own 3D design of a ball and socket joint to create a full functional and flexible tripod. Instead of focusing on a large, traditional tripod, we are going to recreate a smaller version that is portable and much easier to travel with. Additionally, it is capable of wrapping around poles and standing upon all surfaces without moving or collapsing. The bottom left two objects (sphere atop a cylinder/dark green half circle) we are both going to 3D print next class. We made these two models today along with a few other beginning works (three objects in the back) to get a jump start on our process as the most import part is to prototype something to further edit and refine. We took a 22 millimeter diameter circle and placed it atop a 16 millimeter diameter cylinder to 'group' the two and make it a connected one-piece model. Then, as part of the beginning of the process, we took a sphere at set the diameter to 25 mm, thus assuming that the thickness of the material is 3 mm. Next, we took a box (rectangular prism) and covered a little less than the bottom half of the sphere at exactly 11 mm (if it were to be exactly half then the ball would slip out of the socket and the whole model wouldn't work) and set the box as a 'hole', so that when we 'grouped' the two, the bottom part became invisible, as shown in the bottom center of the photo above (dark green). However, this object still wasn't hallow. To make it only 3 mm thick along edge, we placed it atop the sphere/cylinder model and making the sphere a 'hole', in order to create the hallowed inside. Finally, we took the top off of the sphere and placed it on the ground right after making the sphere 'solid' once again. For now, the two pieces are separated to see how the top fits on the ball and if it needs to be a tighter or looser fit. Eventually we will place the sphere and cylinder combo atop the covering and 'group' it all together to great one final piece and product. 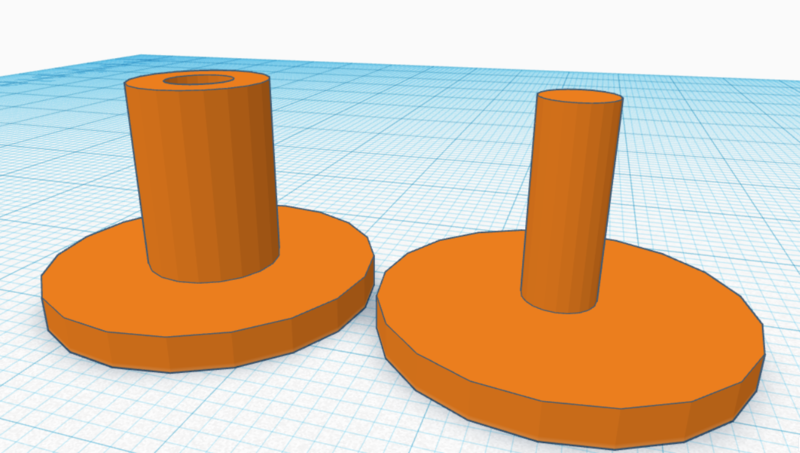 After adjusting the height to 19 mm and the width to 29 mm I printed the object along with another with a width of 30 mm (in the bottom left) with the semicircle attached to the bottom of the shaft in the ball and socket joint. Together the fit together such that the solid sphere was able to find inside the semicircle, however the ball failed to stay put inside of the joint. This is a better step that before when the ball wouldn't fit at all. With the same dimensions as previously recorded (19 mm x 29 mm), I attempted to 3D print the figure in the foreground (middle/center). To get it the ball and socket joint to function properly, I decided to print it where the semicircle is already on the sphere. Through Simplifier 3D, I created a support for the sides of the semicircle so that the machine wouldn't print on air. The final product was a little too loose and the ball still came out of the socket, so next time I am going to adjust the cap so that it covers the ball a few millimeters more and have the diameter of the semicircle a little smaller as well. This (3rd) prototype that came out functions almost perfectly and does basically what I want it to: the ball is already inside of the semicircle (able to break off a seal inside to the get it moving) and moves around well, however, maybe too well. The ball is so flexible that it has the ability to pop out of the covering. The covering was printed so that it covered the sphere more, which was successful in itself. So, still when printing for next time, the height and diameter of the semicircle needs to shrink. Finding the perfect match is difficult, so it is simply just trial and error. This model definitively came out smaller - and too small. It took a wrench to get break the seal from the ball to the covering and thus, ruined the figure it became too warped. I think that since the prototype got printed so exact that the semicircle and the top (ball) in the ball and socket joint were printed together. As said before, I have to adjust the height especially and make the diameter maybe a little wider to get the perfect fit. In an attempt to print the model upside down, thus without a support, but with a raft. The machine really didn't like printing the sphere upside down as it took five tries to print out these two figures. The overall sphere (ball) was squished too much, so the ball didn't fit in by any means. Through the advanced settings that Mr. DiGiorgio showed us, we were able to configure and print our very first workable model! We printed the two pieces separate to start. The ball moves inside the socket perfectly - neither too tight of a gap, nor too loose - and seems very sturdy. 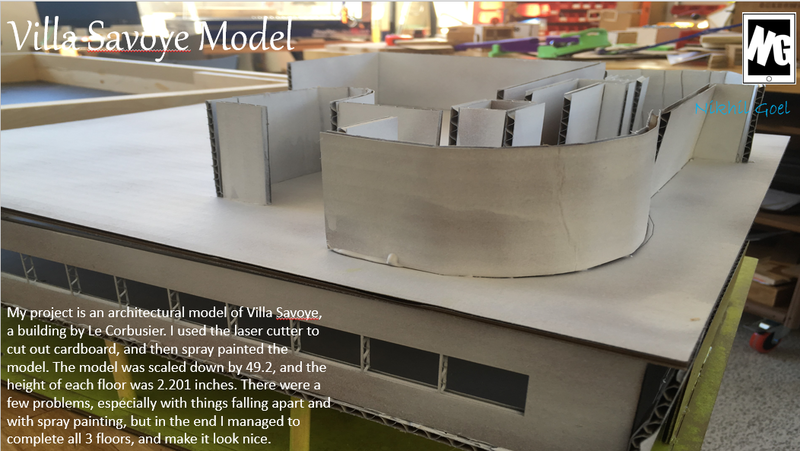 Our next attempt was to use our first fully functional model and connect the two pieces together, so that it would model more of what the final version will look like. We printed two of the figures and they too fit together very well like the first run, last class. This time we took Mr. DiGiorgio's suggestion to make the sides of the socket thicker and stronger in this prototype. We attempted to take a large scale of the socket and group it together with the actual figure to create a thicker and denser wall (so that it would be less likely to break off). In trying to fit the ball into one of the sides part of the socket broke off as seen above. To prevent this from happening, next time we are going to go back to our original model and simply put the input settings in 3D Simplifier to where it prints the wall of the socket with more layers (3 or 4). Additionally, the shaft that connects the ball and the socket in one piece, we will also increase the layers in that wall to make it not warp or bend and disfigure in any way (basically make it stronger and thicker as well). Still experimenting with 25% infill, a raft for support, high quality for printing, and we also have taken the model from Tinkercad and lowered it two millimeters down because the curve of the socket wasn't coming out well in the prints. These settings (except for maybe the infill) is final and now we are going to print out around 30 of these individual prints, so that each leg of the tripod will have 10 sections. From experimenting with the two different 3D printing machines, we have realized that it is important to stick to one machine, use the same color of material, etc. to keep our models consistent (so that some of the models aren't significantly looser or tighter that the others). We are going to start printing out these models which take about two and a half hours to do (to make two at one time) and being forming and piecing our final product. It was pretty sad to leave the maker space. We had so much fun together as a class- the first prototype class at Hawken and me as the first girl in this class- and I will really miss those times. I wouldn't finish my project today, I had a lot of issues with the electronic part especially the wires because they sometimes didn't light up for no reason so Mr. D had to help me a lot. But now we figured out a way to connect all the LED's and where to put the button. During my Intensive I have to put everything together. Since it didn't really worked out with the batteries in the side I used - after the advice of Mr.D - those bigger Batteries and just put them on the side of the inside. Some skills and techniques that I have learned through this course and project include working with all the machines and software's. I also believe I got a bit more patient and started thinking more about different ways to do something especially after Mr.D told me his idea which I usually didn't like in the beginning and then after some time thinking about it it is a great idea. The most challenging parts of the project was actually the electronic part but then also thinking about how to put everything together and not forgetting anything. As soon as I get some pictures of my current project, I'll upload them. I cut out all the pieces and just have to do the electronic part now. I am nearly done!! My leather arrived yesterday (I want to use it to close the box) and so I have to glue everything together today, figure out the electronic part with Mr.DiGiorgio and then I am hopefully able to present today during class. some pictures of my last wood cut and all pieces of the project put together. I made the holes for the press-fit print and all the single areas. I will work on the other areas to cover the holes and on the space for the electricity (LED, Wires, metal). The pictures are inserted below. I cut my hanger design on carport to look if it all fits together because I am putting all my pieces together with "press fit". i want to do 3 layers, so I can make those holes invisible and it just looks nicer. I am going to post a update of the screen, how my work looks like. I am still working on the design of my hanger. With the Laser cutter I cut all the elements of the outside and glued them together to get an impression of how it might look like. Mr. DiGiorgio and I thought about different ways to design the hanger. Ideas which came up were making the back out of leather (I really like the idea), being able to open the back with the leather (maybe close it by a magnet) and how the front door could work and if we do the door or not. I usually put a whole outfit together with socks, underwear, scarf, pants, shirt - everything. To put everything really together I thought about space in the hanger to put clothes or something different in there. I would use the lower design, I actually don't like the upper one, but I am not sure if it would look that good. I was listening to music and searching in the internet but I didn't got ideas. I just knew I wanted to design something I can finally use. I was drawing a dog, which lights up when you move it's tail - I know it is a stupid idea. I thought about more and more and finally got the idea of designing a nice hanger, which lights up when you get it out of the closet. It should have a button or something with the same effect in the hook. The LED lights should be placed on top, so you can see them when you have clothes on the hanger. Furthermore I thought - with the help of Mr. DiGiorgio - about various ways of putting the hanger together because it would be hard to cut it like that and get the LED's in there.